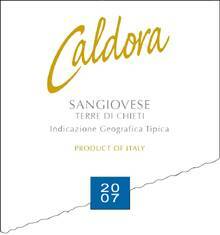 Flavors of ripe cherry and plum with aromas of spice and sandalwood. Ruby red coloring that catches the eye before enticing the palate. Will pair well with pasta, grilled food, or just about anything. Recommendations: When I got this bottle I really had to resist the urge to just open it up and start enjoying it. While patience (and the knowledge that my wife would kill me if I drank this without her) won out, I have to say that this wine was spectacular. Nice, earthy aromas pair well with the cherry and plum flavors and a good tannic finish. Paired with a meal of pasta and red sauce with some ground sausage, this was a perfect compliment to the sauciness of the meal. The flavors of this wine are subtle, but that’s a good thing as it makes it enjoyable to drink even after the meal is finished without making you want more food just to pair with it. Light, easy to drink, and enjoyable with just about any meal, this is a great find for anybody looking to try Sangiovese. Special thanks to the International Wine of the Month Club.